It's been a long time, hasn't it? Hi, my name is David, and I'm recovering from anime burnout. This site has been dormant for about two years, but I'm slowly getting back up to speed with the world of 3x3 Eyes. As you can see from this month's news update, there is a lot to catch up with. Despite the inactivity around here, many people continued to email me, so once I go through my old email (and find the mail archives saved from my old hard drive) I should have some more updates, and some additions to the fanart gallery. As always, stay tuned. Manga vol. 18 cover image taken from the Mark Neidengard Image Archives (see Multimedia Links). 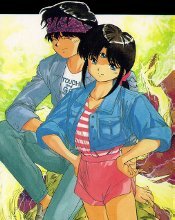 3x3 Eyes story, art, and characters Copyright © 1987-2002 Yuzo Takada / Kodansha.